All Points Books, 9781250160874, 288pp. 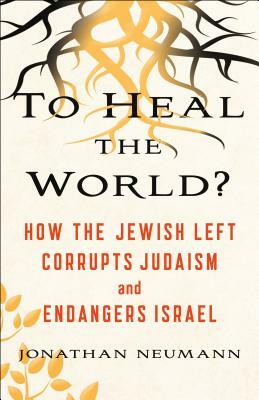 A devastating critique of the presumed theological basis of the Jewish social justice movement—the concept of healing the world. In To Heal the World?, Neumann explains how the Jewish Renewal movement aligned itself with the New Left of the 1960s, and redirected the perspective of the Jewish community toward liberalism and social justice. He exposes the key figures responsible for this effort, shows that it lacks any real biblical basis, and outlines the debilitating effect it has had on Judaism itself. Jonathan Neumann is a graduate of Cambridge University and the London School of Economics. He has written for various American, British, and Israeli publications, was the Tikvah Fellow at Commentary magazine, and has served as assistant editor at Jewish Ideas Daily. He is the author of To Heal the World? "There is a strong and growing segment of Jews who are critical of liberal ideology and of their co-religionists who embrace it. Anyone wishing to understand the critics' point of view would do well to read Jonathan Neumann's new book -- a hard-hitting polemic against the Jewish left." "This highly readable book is a devastating exposé of one of the worst vices in American Jewish life -- the penchant of many rabbis and communal leaders to pass their own progressive politics off as continuous with the classical Jewish sources. It also opens a window onto a conception of Judaism that is broader, less partisan, and spiritually richer than many Americans have ever known." "For too long, Jewish leftists have used Jewish sloganeering to serve their leftism, claiming that 'tikkun olam' dictates their politics. Neumann shows that the linkage between Judaism and leftism isn't merely false, but fatally damaging to Jewishness itself, and that those who claim they are healing the world on God's behalf are in fact ripping out the roots of Judeo-Christian civilization while cynically flying the Biblical flag." "It is all too rare for any intellectual, let alone a Jewish one, to blow the whistle on one of the tragedies of Jewish and modern world history. But that is what Jonathan Neumann succeeds in doing in this consistently absorbing and important book. Keep some tissues handy -- if you love Judaism and Israel, you might shed tears." "Nothing short of a lethal indictment – actually a conviction – of the leadership of liberal Judaism, documenting the distortion and destruction wreaked by an assortment of misguided and agenda-driven left-wing icons and activists during the past half century." "This is a turning point, a moment of awakening about just how bad things have gotten, how distorted Judaism has become. Well written, deep, textually aware, thoughtful, idea-driven rather than ad-hominem. This is the book to return sanity to Judaism." "An important new book. The tikkun-olamers, Neuman shows in painful detail, have cherry-picked the Bible to reinterpret the decisive events of Jewish history in their cause... The Jewish Left’s version of tikkun olam reduces a robust religious tradition into contemporary progressive talking points, to human will with a mild Yiddish accent… Neumann is a right-winger like me, and I relish his excoriation of the Jewish left. " "A knowledgeable Hebraic critic considers a concept honored by the vast majority of his co-religionists and finds it all wrong." "The work will spark useful discussions about the intersections of Judaism and politics."